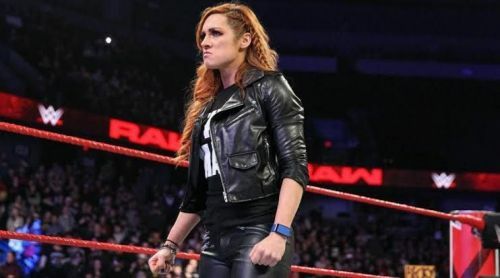 Becky Lynch is currently the hot favorite of WWE Universe, and she is scheduled to face Ronda Rousey and Charlotte Flair at the Grandest Stage of Them All. The Man is set to mainevent the Showcase of Immortals. The three women could become the first women to mainevent a WrestleMania in the history of WWE. Lynch won the Women's Royal Rumble match this year, and she challenged the current Raw Women's Champion, Ronda Rousey, at the Showcase of Immortals. Surprisingly, the former Smackdown Women's Champion was pulled out of the title match, and Vince McMahon replaced Becky Lynch with Charlotte Flair. There is no denying that several fans were unhappy with the decision of Vince McMahon, but it was a move to make it a triple threat match in New Jersey. Subsequently, Becky Lynch was added to the Raw Women's Championship match after she overpowered Charlotte Flair at Fastlane. Though Lynch did not pin Charlotte, she won the bout by disqualification after Ronda Rousey interfered. With a blockbuster triple threat match to headline the Show of Shows, Becky Lynch is undoubtedly a favorite candidate to dethrone the Rowdy One. WrestleMania is just three weeks away and the excitement sky-high for the bout. Moreover, Vince McMahon's billion dollar company has been building the match for months. Here we discuss three reasons why Becky Lynch should grab the Raw Women's Title at Metlife Stadium. The SmackDown Live has an entirely different roster from RAW. Since Becky Lynch has been part of the blue brand after the brand split, she fought nearly all women of the Smackdown Live. However, Lynch has not faced most women of RAW, and she could offer fresh rivalries if she wins the Raw Women's Title next month. The RAW roster is filled with numerous talented women who can offer extraordinary fresh feuds with Becky Lynch. Since Charlotte Flair is involved in the Raw Women's Title match, she is also expected to switch brands after the Show of Shows. Hence, Charlotte could produce a great feud with Lynch on RAW. With Ronda Rousey's future ambiguous in WWE, it will be interesting to see if she continues the current rivalry. RAW has competent women like Sasha Banks, Bayley, Nikki Cross, Ember Moon and many more. Hence, they could tussle with Lynch for the belt. Though Sasha Banks and Becky Lynch locked horns in the past, the majority of the women of the red brand never fought the latter on the main roster.